I've been studying truth this month. It seems like every time I turn around I'm being taught yet another important nuance of what it means to tell the truth, how to discern truth, and where to find truth. Today I realized again that most of the time truth is right in front of you, if you will only open your eyes to see it. As we know, all things testify that there is a God...He made the earth in such a way, that this is so. A few weeks ago, I read a popular book (recently released as a movie) that reviewers said would "make you believe in God." I read it based on that promise and was sorely disappointed. I got a lot that I hadn't bargain for, but reading the book only left me feeling empty and duped. The evening after I finished the book, I was giving my baby a bath. Her eyes sparkled as she wiggled around in the shallow water. The spirit touched me and taught me a great lesson. I knew in that instant that five minutes of watching my baby float around in two inches of water made me believe in God more deeply and love him more completely than an entire week spent reading about Pi Patel floating on a life boat in the middle of the Pacific Ocean. That was truth that I did not need to go to the library to find. It was right there in front of me. The book I read was gory, but well-written...beautifully written, in fact. My baby used no words but taught me a much better lesson. Today, I was presented with yet another lesson about truth. It was also truth that was right in front of me, the whole time. I opened my Book of Mormon to the beginning in order to start a new course of personal study for the new year. I planned on skipping over the title page, but a highlighted section in the introduction caught my eye. The question of why it is so hard to find a book that truly enlightens has been rolling around in my head lately...and right here was my answer. It said, "I told the brethren that the Book of Mormon was the most correct of any book on earth, and the keystone of our religion, and a man would get nearer to God by abiding by its precepts, than by any other book." And there was my answer. No other book can compare with scripture. 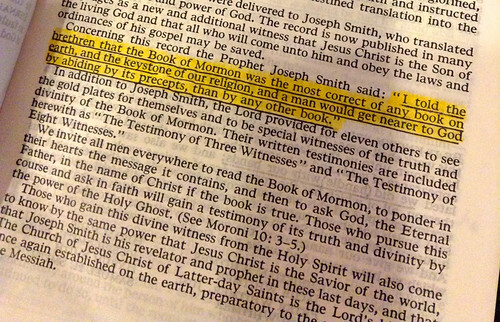 No other book is more correct than The Book of Mormon. No other book will help you get nearer to God. So, if you are looking for a good, unadulterated, life-improving read. I'd start there. good advice-what a beautiful baby girl! WONDERFUL reminder! I really love this. Thanks, Rachel! 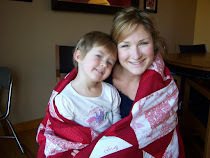 Great post on Motherhood today! I keep telling myself that I really need to take the time to read more extensive book reviews so this doesn't keep happening!! :) But it's good to know that we can't go wrong with the Book of Mormon! This is very true. I have read the Book of Mormon many times. Each time the spirit touches my heart in a new way and reminds me that our Loving Heavenly Father is aware of us, that he has a plan for each of us, and that we can return to him through his Only Begotten Son, Jesus Christ! I'm so grateful to have a testimony and to be a part of His Church. so true. My kids and I are almost finished for their first time. Reading it slowly (over 2 years) has helped me to learn so much and really gain a true testimony of its truthfulness! I am Catholic, but more and more impressed by Mormons. You manage to do what Catholics have not managed to do - be counter-cultural. I'm full of admiration! That is the most WONDERFUL photo of your baby! I love it! We have a baby who seems about that age, and I cannot believe I never thought of letting her lay in and kick around in shallow water! She loves her bath in the sink, but of course I'm holding on to her all the time and she can't totally relax (neither can I). Last thing you meant to have come out of this post - but I'm going to try it! Hi Annie! My baby will be 12 weeks next Thursday! 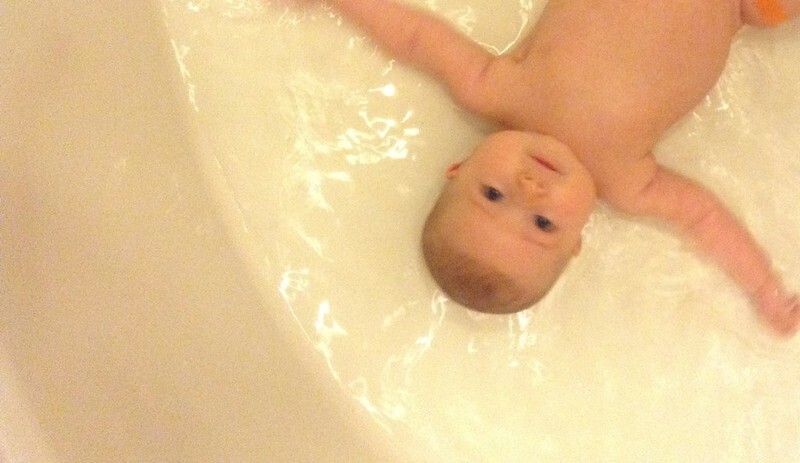 And definitely...babies getting a good splash session on a tub is an awesome side-effect of this post! I would put her in the sink but she seemed too big for the sink from the start...and honestly my sink looked too yucky every time I thought about bathing her in it! Ha ha! Anyway...Catholics are cool in my book too...there are good apples in every bunch. My roommate in college was catholic and she was super sweet and very kind. Love her to pieces! You're welcome to comment here any time! Amen to this one! I have read the Book of Mormon; taught Book of Mormon Classes and in Seminary and I still find it the most enjoyable and challenging book I have ever read. The truths found within are profound. It is also the greatest child rearing manual ever. Your thoughts were enlightening and I loved the picture of that sweet baby. I agree with you, Jocelyn. Of all the books I love, I love the Book of Mormon the most. And by the way, I am finding it harder and harder to locate good books for my reading pleasure. Such a great reminder, i always love the truth found in the scriptures.